Why Are My Settings Missing From The Sharing Station? This guides explains how to easily make sure that there is a smooth transition when making changes in your event dashboard. If you have made changes in your event and don’t understand why they are not visible on the iPad this guide will show you what to do. 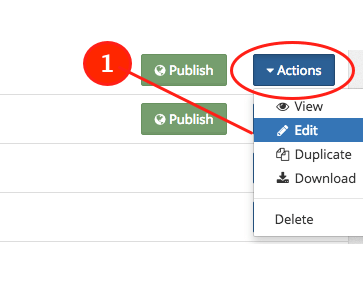 Next to your event name that needs editing click Actions and then select Edit. Once you are within your events settings are modify them to your liking. When you are done adjusting the event settings make sure to press Update Event! IMPORTANT NOTE: On your photo booth PC open up the PicPic Social device server software. On the General Settings tab you will see an Event section like in the photo above. To the right of the Event section press the the UPDATE button. Allow the event list to fully update before pressing Start on the Device Server software again. Force close the PicPic Social iPad app and reopen it to see the changes reflected on the PicPic Social sharing station application.